There is no doubt about it – times are tough, especially after the devastating news about South Africa’s sovereign credit rating being cut to junk status. Most citizens are barely (or not even close to) making ends meet these days. And the reality goes along with more stress, sleepless nights, bad eating habits, low productivity and even depression. The 7th of April is World Health Day. This year the special awareness day is focussing on the impact and the effect of depression. We want to highlight the importance of keeping one’s mind, body and overall wellbeing healthy. We ran a 2017 Wellness Survey on health and habits. And almost 2000 South Africans took part in this questionnaire. The following results stood out from the rest and can shed some light on the importance of one’s overall health. 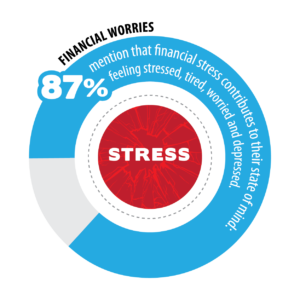 The majority of the respondents indicate that financial stress influences their overall health (71%) and stress levels (65%). 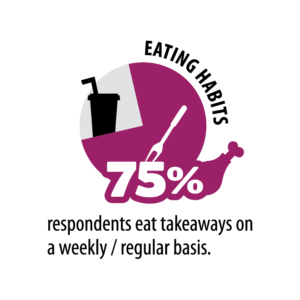 Eighty-seven percent also specify that financial stress contributes to their state of mind by feeling stressed, tired for no reason, worried and depressed. The biggest financial worries respondents point out are: they have too much debt and that they are not able to save for anything. Eighty-five percent indicate that financial stress is the reason for their lack of proper sleep. The respondents that exercise 0-3 hours a week also indicate that they sleep less than seven hours an evening. These patterns, therefore, leave them feeling more stressed, tired for no reason, depressed and even unhappy. Financial stress can drain one’s energy which has a direct impact on work productivity. 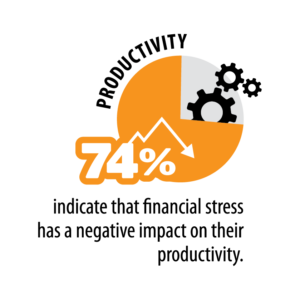 Seventy-four percent of the respondents say financial stress contributes to their low productivity levels and the respondents also say they were absent a total number of four days at work in March 2017, because of their mental health. Almost 60% rate their productivity only as average and below average, nothing indicating to an above average or very high. • Eat regular healthy snacks to keep sugar levels intact and to not skip meals as this will keep not only your body but also your mind, healthy. • When hitting a productive low, you can boost your energy levels with a walk around the office, a fast climb up the stairs or some ‘deskercise’ (exercise at your desk). There are quite a few exercises you can start doing – it does not only give you a break from sitting at your desk, it is also fun and refreshing. • Good sleeping patterns and regular exercise helps to not only get your body active and healthy but also your mind. • Financial stress is a part of South Africans’ lives these days but you can try your utmost to lighten your load. Go and see your financial planner to set your finances off in a new and better direction. World Health Day is the perfect ‘encourager’ to start taking a serious look at your lifestyle, overall health and financial situation. The time is now to start doing something – so get started and turn a brand new leaf to a stress-free and healthy financial future.